“If you want a hearing, you better shut up,” Senator Orrin Hatch told a group of protesters who had arrived at Monday afternoon’s Finance Committee hearing to voice their concerns about the revised Graham-Cassidy bill. 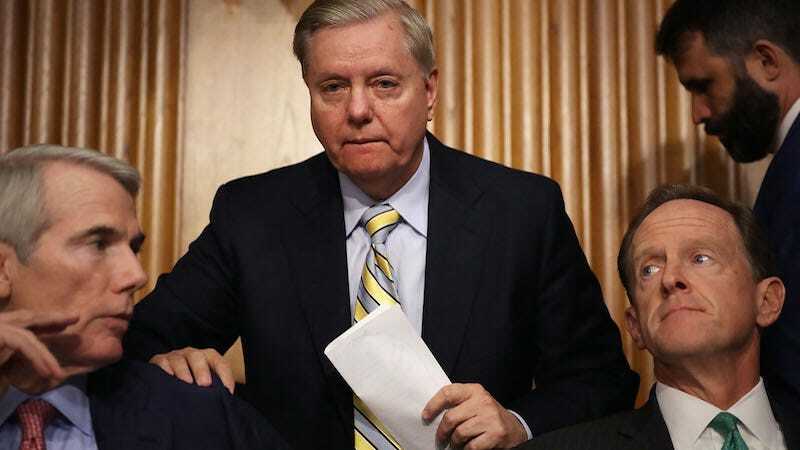 Last week, Graham-Cassidy, the latest Republican plan to repeal and replace Obamacare, looked like it had little chance of passing as a handful of Republican Senators said they were not won over by the latest repeal and replace plan. Their objections ranged but, in large part, swing votes like Alaska’s Lisa Murkowski and Maine’s Susan Collins, as well as John McCain (Arizona) and Rand Paul (Kentucky) said they would vote “no” on the original bill. Under the revised measure, the bill’s authors now project increases in federal funding for Arizona (14 percent), Kentucky (4 percent) and Alaska (3 percent), which would have seen declines in funding under the previous version, according to a leaked analysis from Trump’s health department. In particular, Murkowski’s home state would uniquely benefit from Sec. 129, which allows the state with the highest separate poverty guideline — Alaska — to receive a 25 percent hike in federal matching funds for Medicaid. The core of Graham-Cassidy, however, still remains intact, even after the updates. Essentially, Obamacare funding would be converted into block grants distributed to the states so that they could set up their own health care plans and Medicaid would be regulated with spending caps. In addition, the revised bill would allow grant states more power to eliminate federal insurance regulations, a compromise to earn the votes of Senators Ted Cruz (Texas) and Mike Lee (Utah). That concession would allow for states to offer plans with cheap premiums but incredibly high out-of-pocket costs that are currently barred under Obamacare. Critics of Graham-Cassidy say that the revised version, the subject of today’s hearing and protests, makes it quite clear that the bill removes Obamacare protections for patients with pre-existing conditions. “If there was any question about Graham-Cassidy’s removal of federal protections for pre-existing conditions, this new draft is quite clear,” Larry Levitt, Senior Vice President for the Kaiser Family Foundation, wrote on Twitter. “The revised Graham-Cassidy is in effect federal deregulation of the insurance market,” Levitt added. Put plainly, even in its revised state, Graham-Cassidy would make deep cuts to Medicaid (even with the additional funds, states like Alaska would receive less funding than they would under Obamacare) and remove many of the popular federal protections, including caps on out-of-pocket costs and protections for those with preexisting conditions (individual states will decide how much insurers can charge those with preexisting conditions). In addition, states will no longer be required to submit a detailed health care plan in order to obtain a federal waiver for insurance requirements, they will simply have to describe their plan. In addition, the revised Graham-Cassidy would allow states to remove the Obamacare protection that requires most employers to provide birth control. If the quick pace of Graham-Cassidy seems familiar, then it is. The breakneck speed at which the bill is moving is reminiscent of this summer’s late-night vote on the last minute, late-night “skinny repeal” vote. Republicans are working on a short deadline; they have until Saturday, September 30 to pass the bill with a simple majority of 50 votes. After Saturday, they will need 60 votes to pass any repeal and replace. Because of the pace, the original Graham-Cassidy has not yet been scored by the Congressional Budget Office, the CBC’s initial numbers are expected later this week. It’s unlikely that the revised plan will be scored before the Saturday deadline. It’s still unclear whether or not Graham-Cassidy will have the votes to pass. Politico reported on Monday that Republicans are “increasingly resigned to defeat in their final bid to repeal Obamacare this week” despite the last minute revisions to the bill. The bill remains deeply unpopular with voters and, according to a recent poll, only 20 percent of Americans support the bill; most voters seem to agree with the protestors who were removed from today’s hearing after briefly forcing a recess. Update, 6:40 p.m.: Susan Collins said in a statement that she will vote “no” on Graham-Cassidy health care bill, even in its revised state. She outlined “three major concerns” with the bill in her statement, including its cuts to Medicaid, its weakening of coverage for those with preexisting conditions, and “higher premiums with reduced coverage.” Collins joins John McCain and Rand Paul as a firm “no,” very likely blocking the bill.